Don't forget, some of us are on different time zones so if you visit a blog and can't find a letter or picture yet, pop back later in the day. The competition is open for one week closing 00.01 hours 7th November GMT. Finally, Theme-a-licious Looking Backward and Forward X will follow on All Saints' Day tomorrow. I spent nearly all of this month working away on Drac-in-a-Box (see previous post) but thank to the Half Term Holiday here I have managed to finish not one, but four ornies in as many days!! 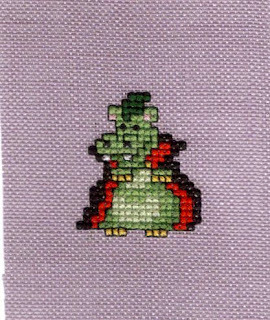 I'll make him into an actual ornie this weekend I think, along with a spooky charm. The third and fourth pieces I am saving for tomorrow for the Hallowe'en Blog Hop and Theme-a-lious updates respectively. 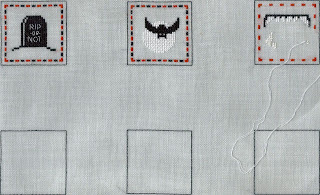 I did stitch a Hallowe'en ornie this month but it's not actually relating to the chosen theme of owls. I do have an owl one for next month instead of candy corn because we don't really have that in this country. We do have Cadbury's Screme Eggs though and I had one yesterday. Yummy! 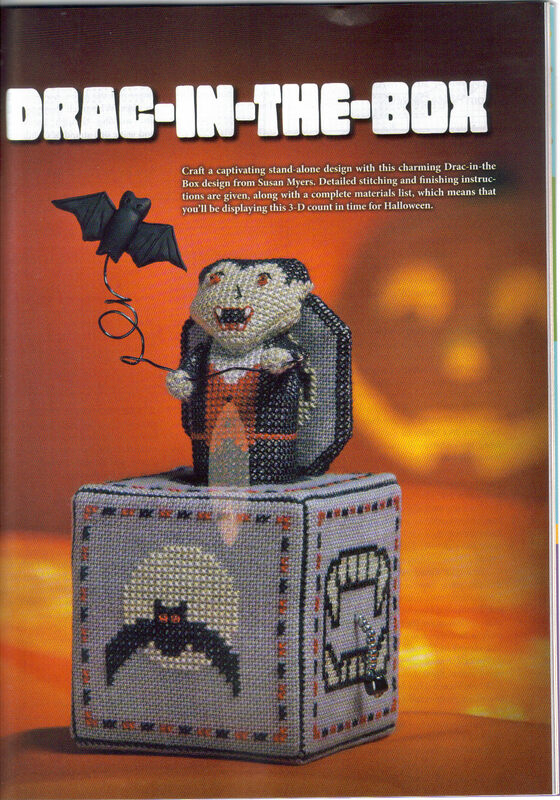 Finally, thank you all so much for your comments on the Drac-in-a-Box post. I do like to follow my stats and usually about 10% of the page views lead to a comment. In this case it was nearly 50%!!! I do find myself that I am most likely to comment on a Happy Dance blog post and it's obviously true for other people too. Thank you all again, it means alot to me. Rather than a Happy Dance, we'll have a Happy Jump Up! The body is not quite as designed because JCS decided not to publish the useful diagram Susan sent them which showed exactly how to sew up his body. 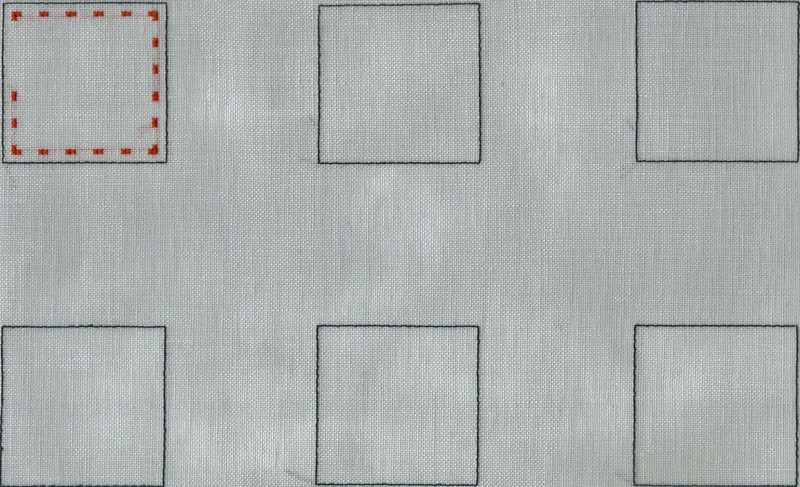 You can find the diagram on this blog post she made. 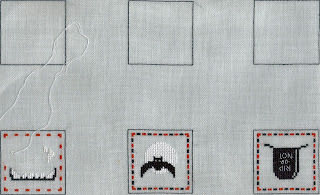 Basically you mount each square on a piece of card then whip stitch them together. I used double sided tape on the reverse to hold, the fabric in place and masking tape to hold the corners down. I used thicker card than recommended which meant my box didn't need stuffing as it stands up on it's own. oops, I've fallen over and you can see my bottom! 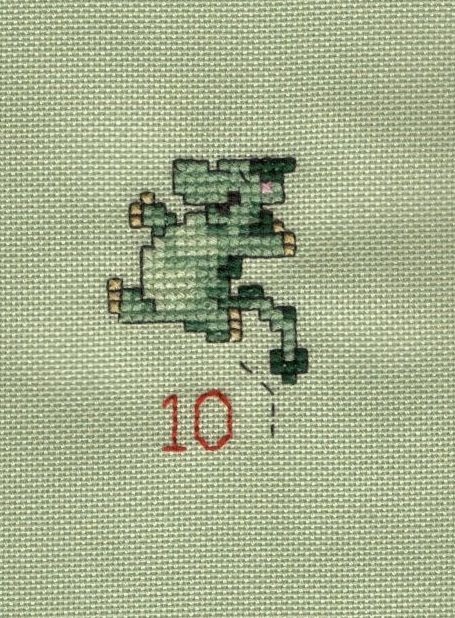 Difficulty: Stitching, easy. Making up - Box, fiddly but easy, Figure - tricky! Especially the arms. Finally, I have sent out the details to all the participants for the Hallowe'en Blog Hop this afternoon. If you are taking part and haven't had an email please let me know. Stitch By Rachel, please get in touch with me using an email address as soon as possible please! or Numb-Bum Weekend as it's also known!! I nearly always sign up for IHSW but usually forget to blog about it! So here is a blog post just for a change. On the right, Drac's face and my start on the body. I managed this small amount of black before I got bored and decided to cheat! 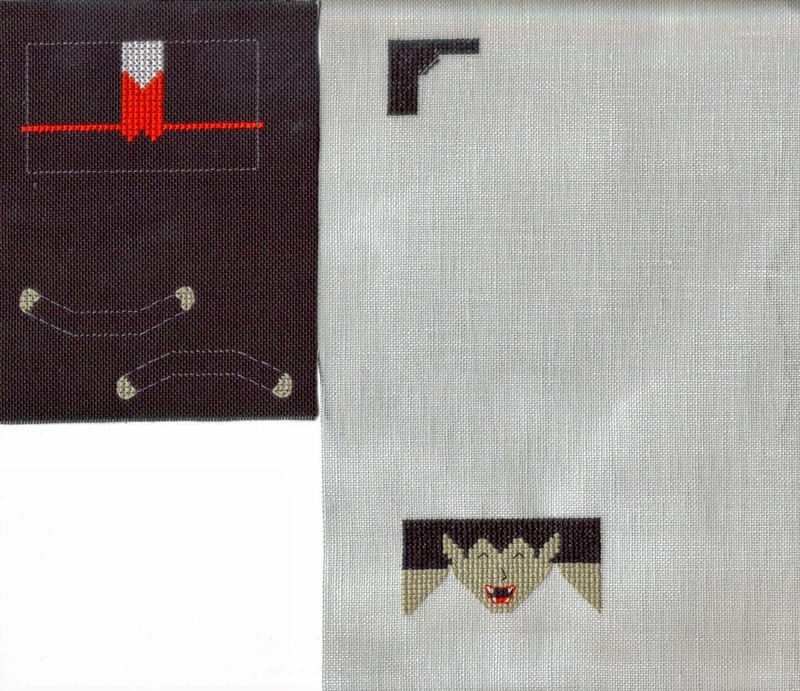 Instead of stitching all that black I just used some black evenweave and stitched the coloured parts. 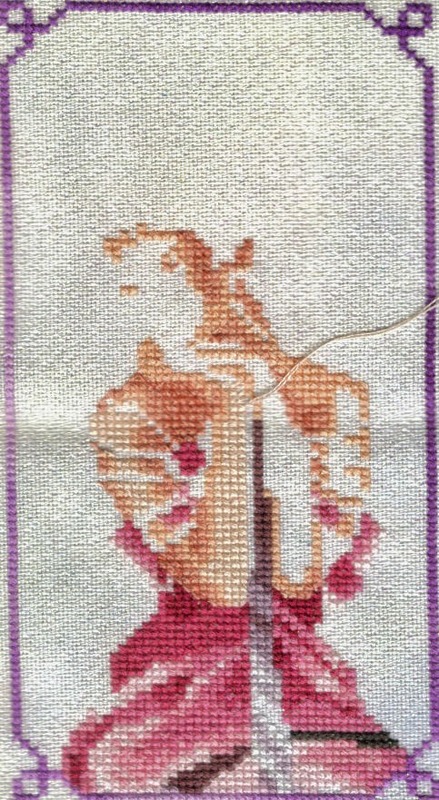 I have to add some little beads to the waistcoat and his eyes then I'm set for the making-up. Watch this space! I finally got to work on something other than pink or flesh. Some of those lines on her arms will be for beads. Finally, this will be the last call for people to sign up for the Hallowe'en Blog Hop. Just click on Mr Boo on the right hand side bar for details of what you have to do. 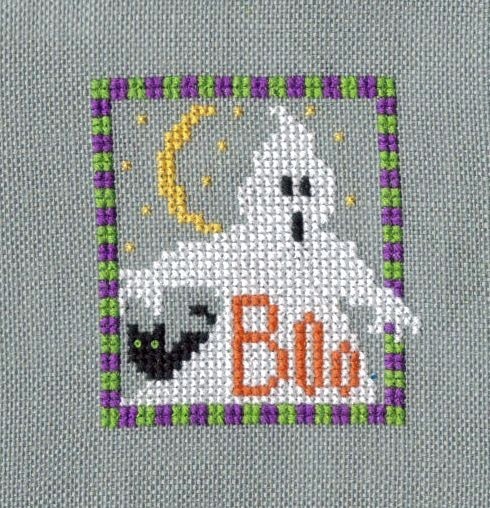 Incidentally, Mr Boo is designed by Val from Val's Stuff. 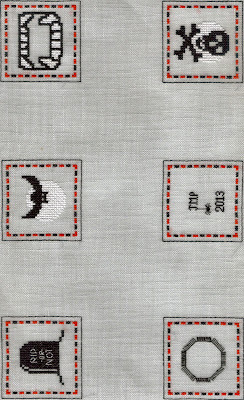 You can get her designs from 123stitch online and probably other places too! 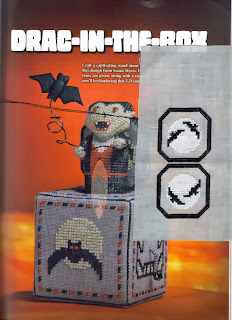 This one came from Just Cross Stitch magazine last year's Hallowe'en ornie special. I managed to stitch something other than pink - pale flesh!! Most of tonight will be pale flesh too. Finally for those of you still deciding whether to join us for the Hallowe'en Blog Hop here's a list of freebie designs I love! If you have seen any other lovely Hallowe'en freebies around this year, please leave a link in the comments and I will add them to the list. The fabric is sparkly, does that count? 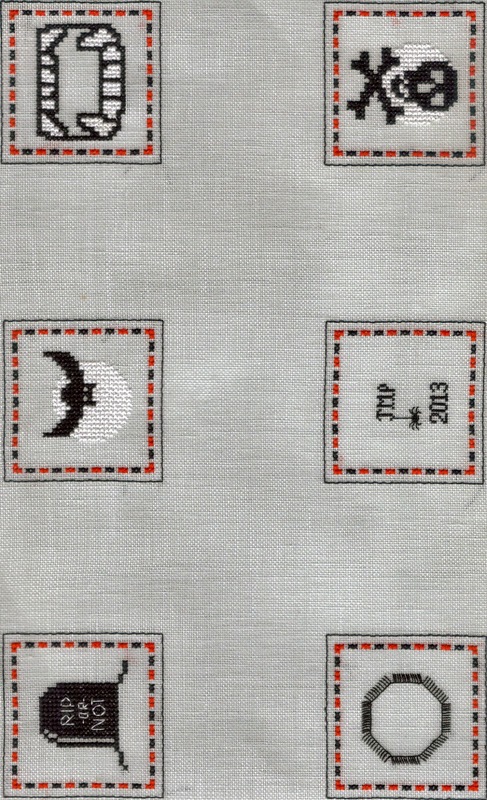 It's orientated like that on purpose because I stitched them whichever way up was easier to hold the fabric. A while back I won the back catalogue from Nicole and they are absolutely gorgeous designs. The instructions are really good too. Nicole has a nice friendly style of writing so it feels like a friend explaining how to do the stitches rather than a textbook. 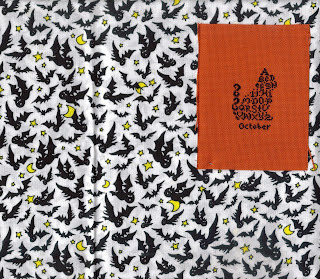 Finally, there are still places available for the Hallowe'en Blog Hop on the 31st October. Simply click on Mr. Boo on the right hand side bar for more details. It's quite interesting looking at the original blog photo to see which parts they stitched in which colour. 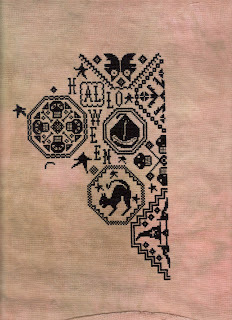 The chart didn't come with a key and they used the same symbol for every stitch so you wouldn't be bound by their choices. I like my version. The whites do pop more in real life. 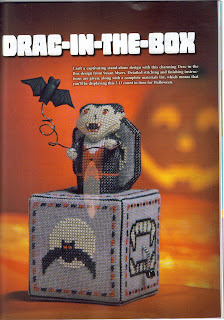 I have not been in the mood for Christmas stitching as yet, it's not even Hallowe'en so I have made a good start on my Drac-in-the-Box. I want to get this done by the 31st if only because everyone keeps saying "Let me know how you get on with the finishing"! 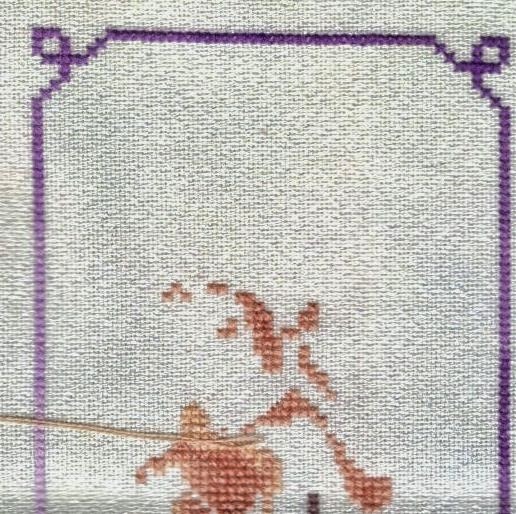 I posted a picture on FB of the first steps I'd done and the designer left a comment saying how pleased she was someone was going to stitch it. So not much pressure there to make a good job of it! I changed the orientation of the blocks simply because I found it easier to hold the fabric this way. It's a very stiff Permin linen and I don't want to crumple it too much. 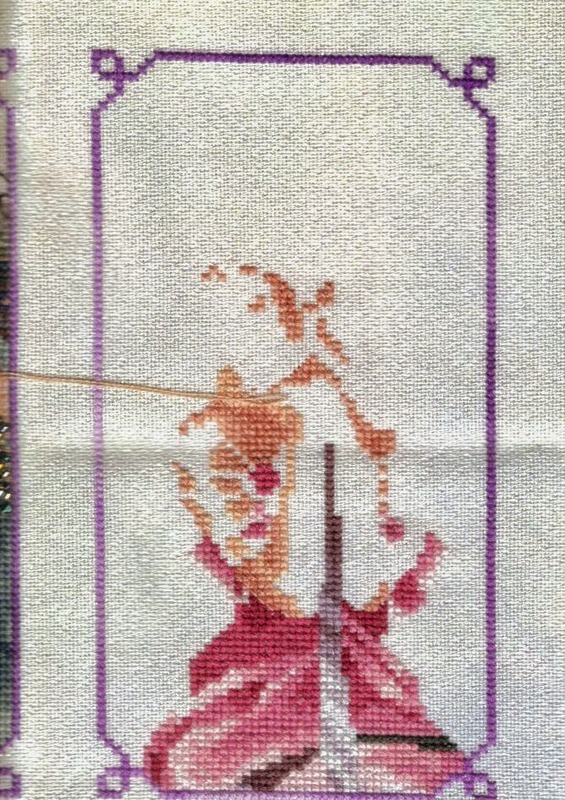 Not a great picture, it's a scan and the purples in the sash are not showing up well. 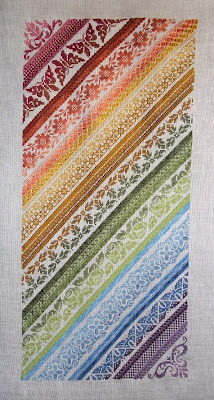 They are actually the Teresa Purples (3041 and 3042) so called because Teresa Wentzler seems to use them in every design she does! You can really see the shape of her arms appearing. There's alot of flesh to do next, then her hair and finishing with the wings. Finally, the sign up for the Hallowe'en Blog Hop is open. 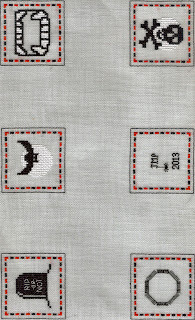 Click on Mr. Boo the Ghost on the right side bar for more details. October's ORTS are pictured with my Haunted Castle from La Contesse and my current project Drac in the Box. I have stitched one box side. It took me most of one day because I kept popping onto the computer to converse with my good friend Shirlee. Do you like the lovely photo of her to the right of my blog? 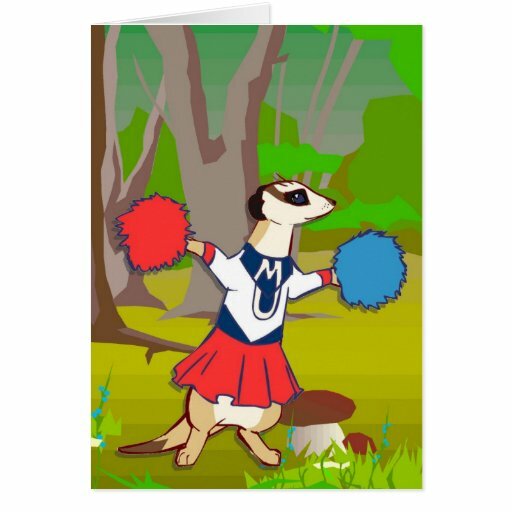 Did you know she is a cheerleader? Needs another M for MUM! In case you can't tell, it's Titania Queen of the Fairies. Love all these shades of pink in her dress. Finally, sign-ups for the Hallowe'en Trick or Treat Blog Hop are now open. I have a great group so far, more than last year already! But more are welcome. the more, the merrier. Or the more, the spookier! All you have to do to join in is email me to sign up. Then on 31st October post a photo of something you have stitched on a Hallowe'en theme alongside a letter of the alphabet which I will allocate you. The letters will spell out the mystery phrase. 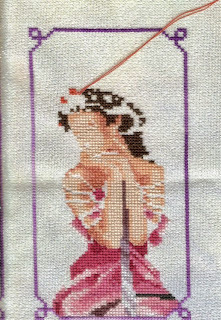 Lesley-Ann and Stitch by Rachel, please could you contact me by email as you are both "no-reply" commenters. It's October and time to sign for the annual Trick or Treat Hallowe'en Blog Hop which will take place on the 31st October. No surprise there for the date! 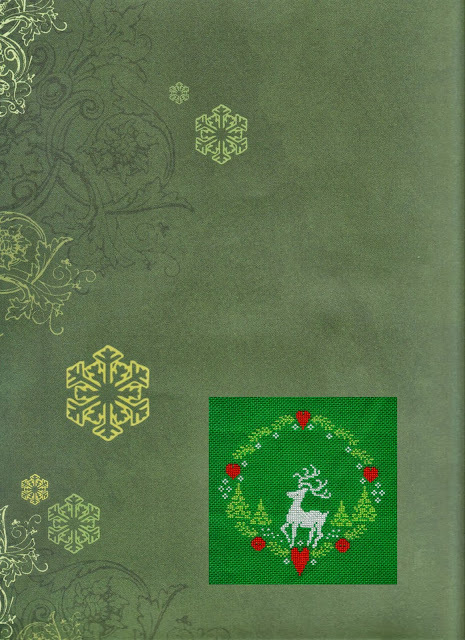 Those of you with long memories may remember last year's Blog Hop, found here. If you'd like to host a Haunted House all you have to do is email me to let me know you want to take part. I will allocate each person a letter of the alphabet. 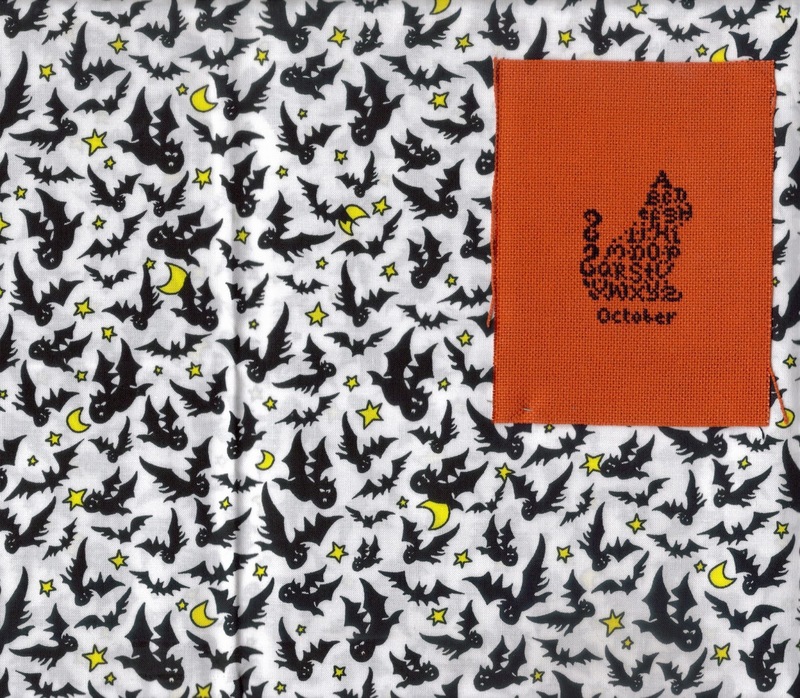 On 31st October you must post your letter plus a photo of an design you have stitched on a Hallowe'en theme. I will list all the blogs taking part in order and the Trick or Treaters can hop around collecting the letters and working out the hidden phrase. Leave a comment back on my blog and one lucky person wins a small prize. Woo-hoo! You can be both a Host and a Trick or Treater too. Impressive? Shebafudge did warn me the amount of fabric they list is completely over-the-top. 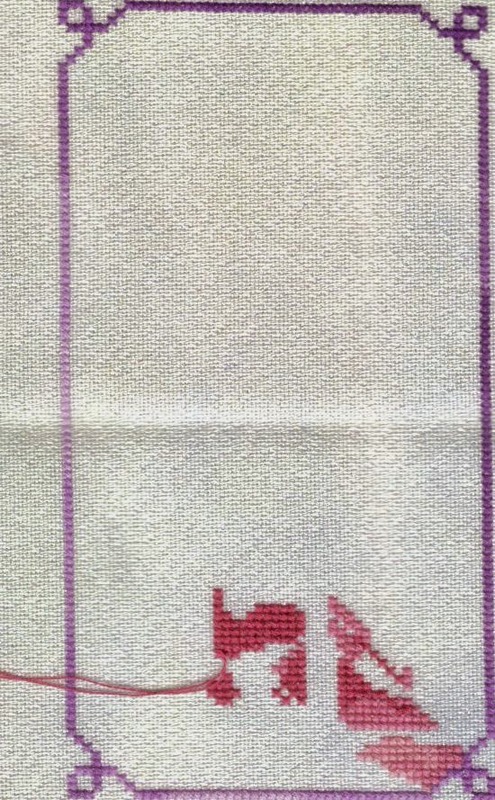 For example, these side pieces are 2.25 inches square. 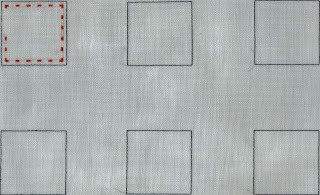 They recommend a 6 x 6 inch piece of fabric for each one, so a piece 18 x 12 inches. Mine is 13.5 x 9 so roughly half the size of their's. What a waste! 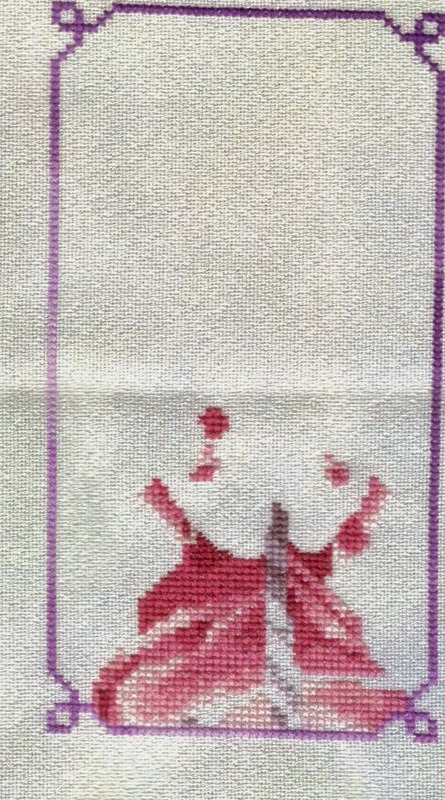 To make the box up they say cut each square with a 1/4 inch margin, so why stitch with more than a 1 inch margin? 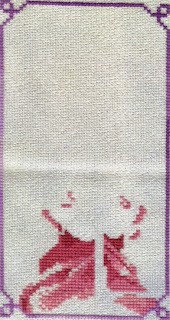 Anyway, the boring bit is done and now I can get on with the motifs. 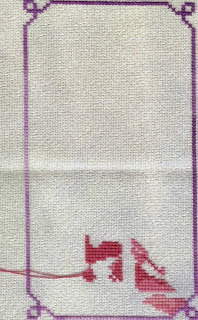 BTW it's a 32 count Permin linen called Star Sapphire. 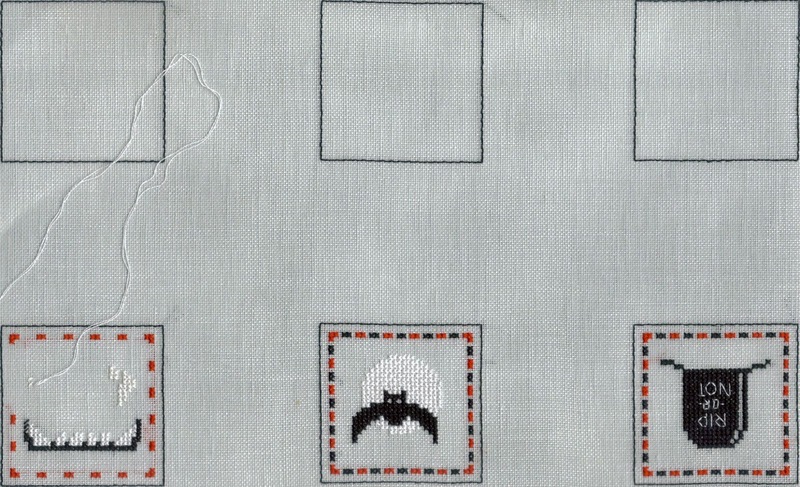 Finally, could you identify the design I'm stitching for Rachel's large Mirabilia Round Robin from this photo? 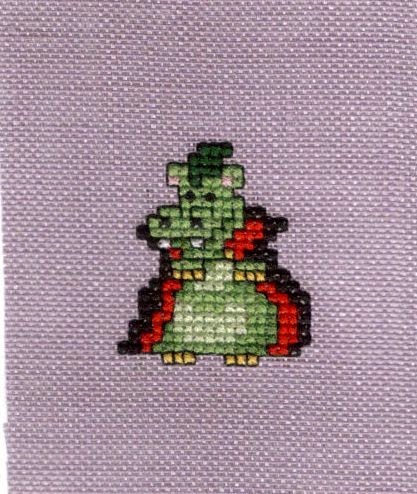 This is the result of two evening's stitching which I posted on the Mirabilia Minions FB page. Incredibly some people guessed the design from this small amount! They are true Minions. Just for fun I will leave revealing the answer until next time to see if any of my followers can claim to be Mira Minions too.